In 1964 Al and Inez Heller started a local service company to install and service Genie garage door openers manufactured in Alliance Ohio. Genie of Fairview Door Co. became one of the first companies in the United States to become an Authorized Genie Dealer. 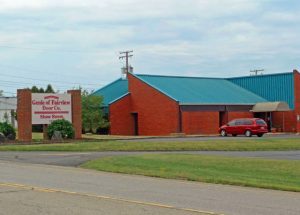 Our parents’ first retail location in Fairview Park, Ohio gave us our name. To this day, we remain a family owned business and still adhere to principles held by our parents when they established the company over 50 years ago. Those principles are to provide quality workmanship and products, reasonable prices, expertise in our work, strong dependable warranties, friendly service and above all, customer satisfaction. Genie of Fairview later expanded into installing new garage doors and repairing broken garage door components. Today, garage door openers and garage doors remain our only business, and we pride ourselves on having more experience in this field than just about anyone. 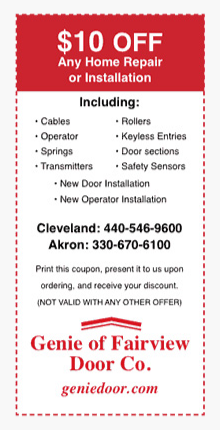 Local customers from Cleveland to Akron, Medina to Mentor may call for service or installation of new garage doors or garage door openers. We provide free home estimates for new garage doors and we have a garage door and garage door opener showroom off I-77, between Cleveland and Akron. In 2006, we took our expertise online and created Geniedoor.com an online parts store to service customers nationwide. Our on-line customers can call for advice on which products to purchase and what options are available. As one of the oldest garage door companies in Northeast Ohio we stock a large inventory from manufacturers such as Genie, Lift-Master, Chamberlain, Sears Craftsman, Linear, Multi-Code, Stanley, Allister and Allstar. Customers can purchase replacement parts and remotes on-line at GenieDoor.com or at our store in Broadview Heights. If you have any questions or comments about our products and services, we invite you to contact us today and we’ll get back to you as soon as possible. Visit our contact page to send us an email. We’re here to help!